Due to its varied ecology and warm climate, Georgia is home to 42 snake species. In virtually every Georgian habitat, snakes fill important ecological niches. Shiny black indigo snakes (Drymarchon couperi) live in South Georgia and are much thicker than black racers (Coluber constrictor) and coachwhips (Masticophis flagellum), which are found statewide. Black racers are uniformly, matte-black dorsally, while coachwhips have a braided tail pattern. Corn snakes (Patherophis guttatus), eastern rat snakes (P. obselota) and pine snakes (Pituophis melanoleucus) are powerful constrictors. The shortened head of pine snakes distinguishes them from rat snakes. Rat snake species differ in color; corn snakes usually have some orange to them, whereas most eastern rat snakes in Georgia don’t. Eastern kingsnakes (Lampropeltis getula), mole kingsnakes (L. calligaster) and milksnakes (L. triangulum ssp.) are all Georgia natives. Eastern kingsnakes are black with yellow markings while mole kingsnakes are brown with darker markings. Two milk snake subspecies occur in Georgia; eastern milksnakes (L. t. triangulum) have red dorsal blotches while southern milksnakes -- called scarlet kingsnakes (L. t. elapsoides) -- are ringed in red, yellow and black. The scarlet snake (Cemophora coccinea) is also red, yellow and black but the markings don’t completely encircle the snake. The three members of the Storeria genus are similar in appearance dorsally, but red-bellied snakes (S. occipitomaculata) have red bellies, and northern brown snakes (S. dekayi) lack the pale neck rings present on the Florida subspecies (S. victa). Pine woods snakes (Rhadinaea flavilata) resemble brown snakes, but they have yellow lips. Ringneck snakes (Diadophis punctatus) have neck-rings and yellow or orange bellies. Identify crowned snakes by their dark-colored head patch; a yellow neck ring distinguishes southeastern crowned snakes (Tantilla coronata) from central Florida crowned snakes (Tantilla relicta). Two species of earth snake live in Georgia: the aptly named smooth earth (Virginia valeriae) and keel-scaled rough earth snake (Virginia striatula). Worm snakes (Carphophis amoenus) look similar to earth snakes but have tiny eyes. Plain-belly watersnakes (Nerodia erythrogaster) have unmarked bellies; brown watersnakes (Nerodia taxispilota) have dark, square markings on a brown ground color; and green watersnakes (Nerodia floridana) are the only variety with a series of scales between the eye and upper lip. Distinguish banded watersnakes (Nerodia fasciata) from the similar-looking midland watersnakes (Nerodia sipedon) based on geography: banded watersnakes live south of the fall line, whereas midland watersnakes live to the north. Eastern garter snakes (Thamnophis sirtalis) and ribbon snakes (Thamnophis sauritus) differ from other snakes by their yellow stripes -- ribbon snakes lack the black lip markings of garter snakes. Mud (Farancia abacura) and rainbow (Farancia erythrogamma) snakes are predators of salamanders. The two species exhibit different color patterns against a black background; mud snakes have red ventral and lateral markings, while rainbow snakes have red stripes. Queen (Regina septemvittata), glossy crayfish (Regina rigida) and striped crayfish (Regina alleni) snakes differ according to their names; striped crayfish snakes have lateral striping, glossy crayfish snakes are iridescent and queen snakes are neither glossy nor laterally striped. The small black swamp snakes (Seminatrix pygaea) have glossy black dorsal surfaces and red bellies. The five native pit viper species are the only snakes in Georgia with elliptical eyes. Copperheads (Agkistrodon contortrix) and cottonmouths (Agkistrodon piscivorous) feature hourglass markings on their bodies; however, in cottonmouths, these markings tend to darken with age. Eastern diamondback rattlesnakes (Crotalus adamenteus) live below the fall line and exhibit their namesake markings instead of the dorsal chevrons found on timber rattlesnakes (Crotalus horridus). Tiny pygmy rattlesnake features a row of dark dorsal spots. Eastern coral snakes (Micururus fulvius) are venomous black, red and yellow elapids, identifiable by their adjacent red and yellow rings. The rough green snake (Opheodrys aestivus) is the only slender green snake found in the state. 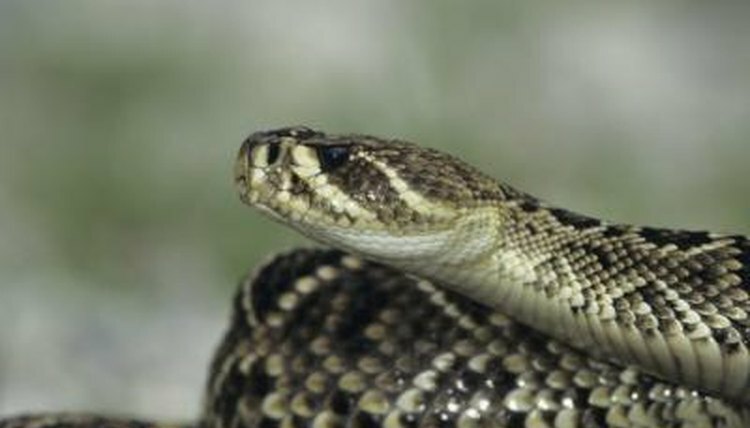 Both the southern (Heterodon similis) and eastern hognose (H. platirhinos) have upturned snouts; the southern species is lighter in color than the eastern species.